Win this print at Design Crush! Click on this image & enter to win my 6-color all hand screenprinted print: "Going To See My Baby Sage" from the blog Design Crush. It's free to enter. Good luck! Free stuff is rarely this easy. This week the fabulous Kelly from the awesome design & style blog Design Crush is featuring one of my prints in one of their fun Win It Giveaways (<–click for details and to enter.) Kelly is not only fun and funny and cool, but as it turns out, she is also from Pittsburgh, and now living in Oklahoma City, OK. Yinz rock! Design Crush is a really super dupes blog, so definitely check it out while you are there. Kelly posts new things just about every day, and it’s all stellar picks from around the globe. Starting yesterday Monday, January 25, 2010 (I’m late to post this, I know, I’m sorry! But there is still plenty of time!) and running through this coming Monday, February 1st at 9am CST you can enter into Design Crush’s Win It contest and get your very own, pristine copy of my “Going To See My Baby Sage” print. Just for you! And just for entering. 1. Head over to Design Crush to enter. 2. Post a comment THERE, as per Design Crush’s instructions, before the deadline and BAM! You are entered and ready for Lady Luck. There are already 73 entrants, so go on with your bad self. Enter today! Love love love! Everyone falls in love. You included! 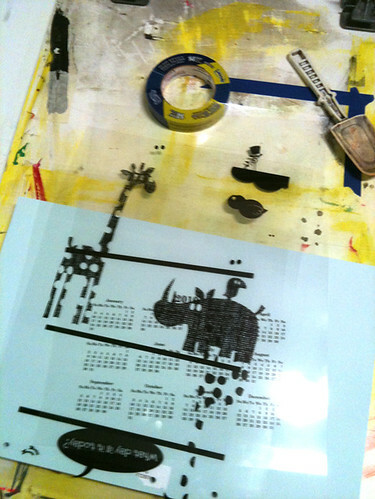 And you are looking at my hand screenprinted, limited edition art print “Going To See My Baby Sage”. This screenprinted happy day is a brand new colorway of a very popular print that I did in 2007, but in a super small edition, now returned in sage green & soft lemon, just for you. 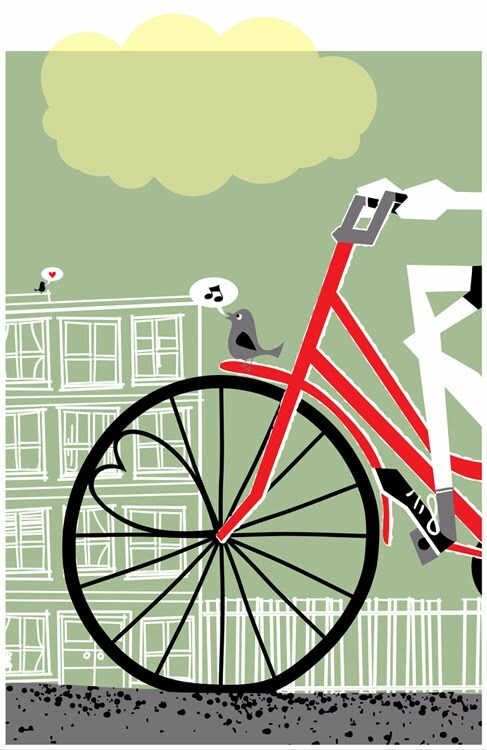 Going To See My Baby Sage is my 6-color, all hand screen printed art print with holiday green sage, bright bike red, dark grey, black and soft transparent lemon hand mixed and non-toxic water based inks. And yes! The lemon cloud breaks the margin/border just like a good cloud should, and is partially transparent over the white margin. Tweet! Edition of 95. Size: 16 x22 inches (39.4 cm x 55.9 cm.) 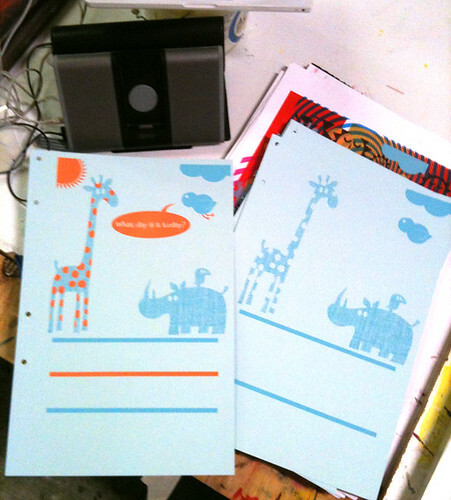 Paper: acid free & archival Cougar, White 100lb cover weight. Click here for more information or to purchase from my website, or visit my Etsy shop or even check out my 1000 Markets shop. Yay! Finally! My first calendar. I’ve been really wanting to do one for oh…about 3 years now. Looks like I finally did it friends. This new release is my 2010 ‘What Day Is It Today?’ Calendar, freshly printed and available now on my website, in the Gigposters.com classifeds and at my Etsy shop or in my 1000 Markets shop. Calendars are very helpful. Especially if you wake up like I do, a little confused and asking the same question every morning. We all have a moment when you can’t always connect up the day of the week with a date and have to ask that same question: ‘What day is it today?’ Well, I’m here to help! Running Sunday – Monday, this traditionally laid out calendar will never leave you guessing. Ahh, if only it could find those missing keys too. 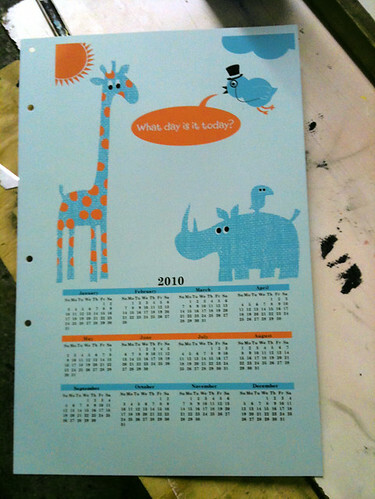 Here is my 3-color, all hand screenprinted calendar with baby blue, sunny orange and black hand mixed and non-toxic water based inks. Edition of only 50 Size: 11 x 19 inches (27.9 cm x 48.3 cm.) Paper: very sturdy French Sno Cone Muscletone 140lb cover weight stock. Films and paper ready to get going to print! All done! 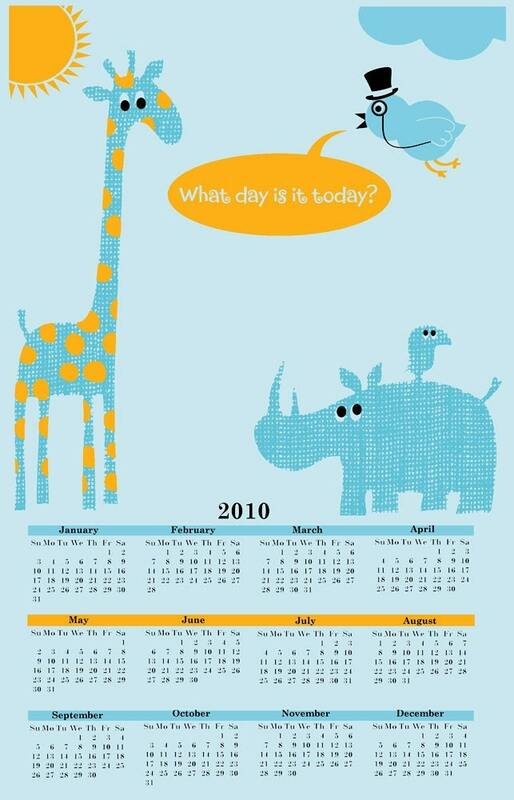 Just 50 were printed of my 2010 "What Day Is It Today?" Calendars. Available now!